Biopharmaceutical manufacturers are under increasing pressure to improve efficiency while maintaining consistent quality and supply of raw materials. SAFC has supplied the top 20 global biopharmaceutical companies for 30 years with custom-made solutions to complex challenges in the manufacture of monoclonal antibodies, recombinant proteins and vaccines. SAFC simplifies the complex task of supplying critical raw materials for your process with worldwide distribution channels and warehousing to ensure inventory where and when you need it. Packaging, testing, and labeling are customized to customer requirements. integrated supplier solutions provide expertise in liquid and powder handling and filtration to offer the most robust, comprehensive solutions and services to meet market demands: upstream and downstream reagents for commercial biologics and vaccines; serum-free, animal component–free and chemically defined media, feeds, and supplements; single- and multicomponent dry powder and liquid product formulations; single-use bioprocessing systems and custom packaging. To meet the industry’s requirement for enhanced raw material characterization, SAFC has developed innovative analytical testing methods that provide customers with biopharmaceutical raw material standards that ensure process development control, production quality, and supply chain security. As the biopharmaceutical industry continues to place increasing emphasis on efficiency, cost containment and increased regulatory compliance, SAFC has embarked on a major global facilities strategy to create Centers of excellence for manufacturing and supply chain optimization. These Centers of excellence will further strengthen SAFC’s seamless platform milling technology for dry powder media and extend the capabilities of our equipment dedicated to animal component free (ACF) liquid media and downstream reagent production. The Centers of excellence model leverages expertise and technology to create best practice–based manufacturing capabilities that result in improved business results through product quality and optimized production practices. Harmonization of North American and European Centers of Excellence facilities around key market requirements for environmental control and segregation ensures global product consistency while providing customers with a robust and secure liquid reagents supply chain. For example, facilities in Irvine, UK and St. Louis, Mo are being harmonized to function as full-range, back-up contingency sites that support each other, improving SAFC’s risk profile for aseptic liquids manufacturing on a global basis. By minimizing product variability, our aim is to reduce customer manufacturing costs while simultaneously enhancing their supply chain integrity. 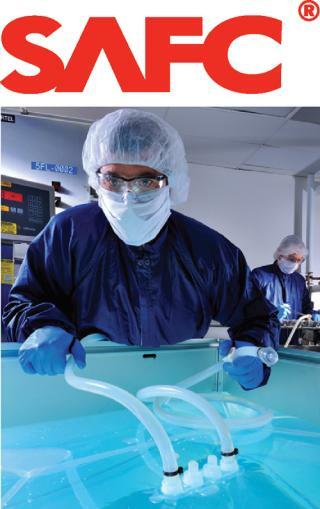 Scientists throughout the world rely on SAFC’s unique liquid and powder manufacturing expertise and high- quality raw materials to help them resolve development issues, develop risk mitigation strategies, and shorten timelines in their drug development programs. SAFC’s supply chain is robust, flexible, and transparent to support on-time delivery of raw materials with the proper quality. SAFC raw materials are manufactured at one of our 30 sites worldwide or can be procured through our network of >10,000 raw material suppliers. We evaluate the quality of every material we sell and support our customers with compliance expertise that understands the critical nature of the regulatory environment. Through partnership with SAFC, you join industry leaders who have discovered solutions to complex problems every step of the way on the path from process development to manufacturing. When you need to make decisions based on critical data and feasible options, we can help you move production schedules in the right direction. Michael D. James is marketing manager, 11296 Renner Boulevard, Lenexa, KS, 66219 USA; 1-913-469-5580 ext 6818, fax 1-913-469-5584, mob 1-650-826-0280; www.safcglobal.com.